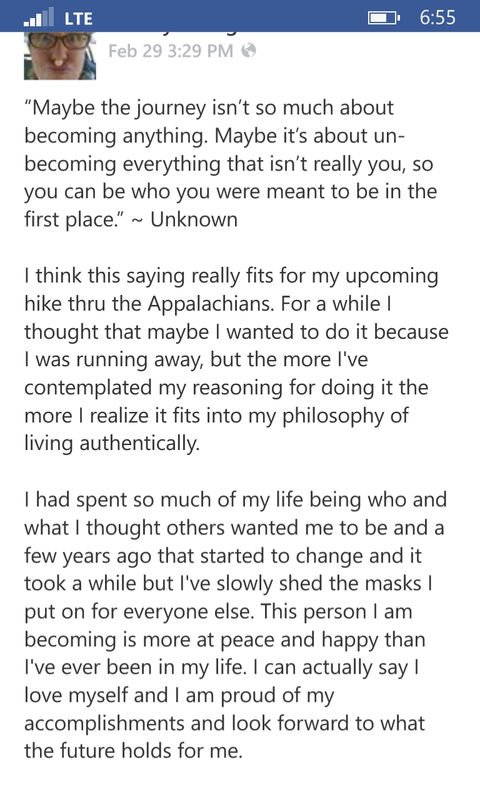 I had a few comments from friends about how I was able to put into words what they had been thinking and/or feeling about their own upcoming adventure on the AT. Like I said in my Facebook post I had thought for a long time that I was maybe running from my life, but I’m not. I have one of those restless spirits that NEEDS to travel and see new things to feel accomplished in life. So I mentioned I was finally feeling inspired to write again after a brief hiatus of writing on my personal blog page as well as this one. Honestly, around the start of the year I had become disheartened as the reality of my hike being delayed slowly crept in and then not being selected as a Warrior Expeditions thru-hiker this year. My original plans would have had me on the trail right now based on all the planning I had done for the past six months, if I had been selected by Warrior Expeditions I would have needed to be on the trail March 21 and that would not have worked…life sometimes has other plans for you and you can either roll with it or fight it. I choose to roll with it and looking back this will be for the better. The last couple of months I’ve been busy helping to rebuild a house so my kids will have a permanent home while I’m gone on my adventures – which most likely won’t end after the AT (the PCT and CDT are already calling me and I can’t refuse the calling). At the same time I am working to get my current home ready to put on the market, I’m not worried about being here for the actual sale as I will have a Power of Attorney in place. I can just shoot for a SoBo hike and pass them on my way to Springer. Whichever I choose it will still be an adventure of a lifetime and either way I now know I’m not running away.